Escape the urban bustle at Slickrock Bike Trail and Canyoning & Rappelling Tours. Discover out-of-the-way places like Park Avenue Trail and Double Down Bike Shop. Make the 11th (Tue) an unforgettable day with an extreme tour. 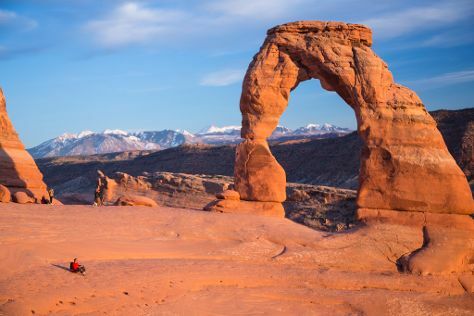 On the 10th (Mon), dedicate a day to the elevated beauty of Arches National Park. There's lots more to do: let the river carry you with a rafting and tubing tour, take in the dramatic natural features at Turret Arch, examine the collection at Moab Museum of Film and Western Heritage, and look for gifts at Moab Rock Shop. To see other places to visit, ratings, photos, and tourist information, go to the Moab journey planner. Indianapolis to Moab is an approximately 7.5-hour combination of flight and car. You can also fly; or drive. Due to the time zone difference, you'll gain 2 hours traveling from Indianapolis to Moab. Traveling from Indianapolis in June, expect nights in Moab to be about the same, around 61°F, while days are a bit warmer, around 95°F. Finish your sightseeing early on the 14th (Fri) so you can travel back home.